One must embody mindfulness in order to teach it well. As mindfulness-based interventions (MBI) grow in popularity, teachers need tools for effective teaching. 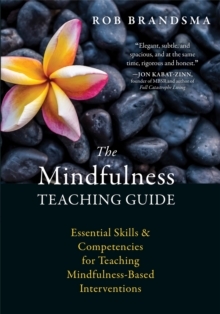 The Mindfulness Teaching Guide offers a thorough and practical guide for mindfulness teachers and professionals, offering a systematic approach to developing the teaching methods, skills, and competencies needed to become a proficient mindfulness teacher. You must embody mindfulness in order to teach it. The Mindfulness Teaching Guide offers a thorough and practical guide for mindfulness teachers and professionals, offering a systematic approach to developing the teaching methods, skills, and competencies needed to become a proficient mindfulness teacher. Mindfulness has captured public attention like never before. From the classroom to the boardroom, everyone is trying to make present moment awareness a part of daily life. Likewise, more and more professionals are adopting mindfulness-based interventions (MBIs) in their work, whether it's in healthcare, education, counseling, or social services. However, many people lack the resources needed to teach mindfulness well. In this guide, you'll learn the three essential skills of being an effective mindfulness teacher: how to guide mindfulness practice, how to explore mindful inquiry, and how to give didactic presentations. Along with teaching underlying theory, this book also offers practical options, suggestions, examples, and even reminder lists so you can swiftly put what you learn to use. The approach in this book is descriptive instead of prescriptive, offering options instead of instructions to help you develop your own style of teaching. If you want to improve the way you teach mindfulness-no matter what kind of setting you're in-this book is for you.